Obsession with Former President is Unhealthy. One disturbing trend among Ghanaian scribes and commentators in the electronic and print media is the tendency to engage in overkill. Once these pontificators stumble into an issue that resonates with certain groups of Ghanaians, they latch onto it, literally beating it to death, that is, analyzing and discussing the issue ad nauseam. 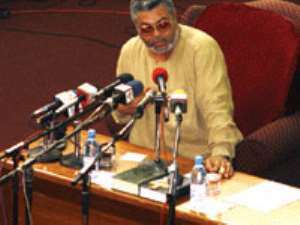 One case that clearly illuminates my point is the clamor of certain media pundits over the testimony of former president, Jerry John Rawlings, before the National Reconciliation Commission. So much cloth is being woven out of his appearance. And, it is self lacerating folly to constantly dwell on what he says or does. Critics have assailed him for withholding valuable information that would have provided Ghanaians a full understanding of some flashpoints in the nation's recent history, such as what prompted the savage murder of three judges and a retired military officer, and other unsolved high profile killings. Supporters of the obdurate firebrand are unmoved; they remain convinced that he plugged in the missing holes. Come to think of it, this should have signaled the end of the strum and noise surrounding Rawlings statements before the NRC. But no, some people can't just let the man fade into obscurity. They love to bring him up at the least opportunity. Ghanaians know that Rawlings is a lightening rod, a polarizing figure, someone whose statements and actions create consternation in some circles, and unbridled love in others. But, the fundamental question here is: should we remain fixated with one man who knows how to stir our emotions for his own partisan interests? The answer is a resounding NO. We have other priorities. Amidst the hand wringing, however, it is important to remember that no matter which side we are on, too much time, effort and ink are being expended on one individual. We better not allow ourselves to be anaesthetized by the sweet nothings of Rawlings. Instead, we should be turned off by his brusqueness. The least we can do as a nation is to ignore his outrageous statements and wave them off as that of a man who still craves the adulation and attention that come with being Ghana's head honcho. Before the nasty emails are unleashed, let me make myself clear...I am not excusing the military excesses that occurred under his watch (as a matter of fact, in a 1994 column I wrote for the now defunct Ghana Drum out of Gaithersburg, Maryland, I did not mince my words in criticizing Rawlings for some of his regime's brutal policies) Far from it. That period, unfortunately, was the most traumatic time in our nation's recent history. The overriding concern here is that the longer this obsession with Rawlings goes on, the more we remain mired in the past and lose our bearings on the battles that lie ahead; improving our education and health care systems, and turning around our nation's perennial moribund economy.